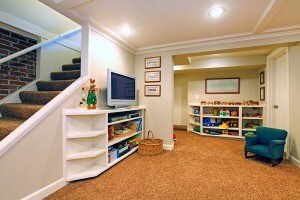 Finishing your basement in Des Moines, IA, is a big project yet one that will yield a variety of benefits. Instead of living with an unfinished basement that is good for little else other than storing things and doing laundry, you can have a full-fledged downstairs living area that is great for relaxing and spending quality time together as a family. Basement finishing typically involves the installation of wood framing, insulation, drywall, flooring, lighting, electrical wiring, HVAC equipment, and other materials that help make the space more habitable. All of your basement can be finished or just a part of it, leaving behind unfinished square footage that you can subsequently dedicate to storage, laundry, and the like. Another great benefit to finishing your basement in Des Moines, Iowa, is that it can increase the market value of your home. Many home remodeling experts believe that a finished basement is a valuable asset and a great selling point in the eyes of prospective buyers. After all, would you rather live in a home with a finished basement or one with a basement that’s dark, cold, and uninviting? In its Cost vs. Value Report for 2015, Remodeling Magazine says that when you finish your basement you can expect to recoup nearly 73 percent of the total project cost when you sell your home. For more information, please contact U.S. Patio Systems and Home Remodeling, a basement finishing contractor serving the Des Moines, Iowa, community.